Denture cleansers are also known as denture cleaners. They come in tablet, solution and wipes form. They are important in denture cleaning regime because they aid in cleaning tough stains which is hard to reach with normal brushing alone. Some denture cleansers claimed they can remove plaque, tartar and whiten the denture. Retrieve the tablet from its packaging and dissolve it inside a pool of water either in denture bath, denture container or a cup. Usually tap water will do unless stated otherwise by the manufacturer. Soaking duration differs with products. 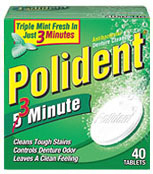 Soak the denture from 3 minutes to overnight following manufacturer’s guidelines. It has different strength to meet your preference. Smoker’s denture may need a stronger denture cleanser to remove tobacco stains. If you want to save more on spending you can break the tablet into two so that you can use half tablet at a time. It is still functional. Simply dilute the solution in water. Soak the denture in the solution. Be aware that some solution requires warm water. For instance Sparkle-Dent Concentrated Denture Whitener. Some are corrosive to metal so do not use with metal incorporated denture. 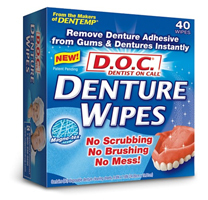 Remove the wipes from its packaging and wipe the denture. Easy to remove denture adhesive. Fast cleansing but tablet and solution is more thorough. Cannot remove stains and tartar. 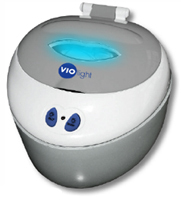 Denture bath is a box or bucket with lid and strainer for denture soaking. 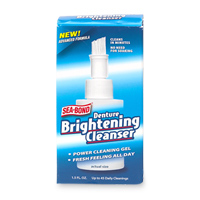 Some have antimicrobial and UV light built in quality for additional cleansing. Safer to soak denture this way to prevent breakage. Aids in brushing of denture without scratching it. Specially designed to allow you to reach small and narrow areas of denture. Soft bristles to prevent scratching of denture. Denture cleansers usually last from 3 to 4 months. It is important to follow manufacturer’s instructions to enjoy their maximum efficacy. This entry was posted in Denture Cares, Oral Care and tagged denture bath, denture cleaners, denture toothpaste, Types of denture cleansers on September 14, 2009 by Dr Erica Tan.